The seal has to be the oceans most lovable creature. So lovable that they are affectionately called the Dogs of the Ocean. Many a diver has had one of these curious creatures swim up to them to steal a “kiss” or to have a cuddle, and now many of those who venture to the Cape to go scuba diving, snorkelling or even just to take a dip, look forward to meeting the oceans most friendly animals. The Cape Fur Seal is exceptionally social. If they are in the area, the moment you jump in the water, they are likely to seek you out. And while we know these creatures as friendly sea dogs, there are plenty of things about the Cape Fur Seal that makes it a fascinating animal! While you can find seals in oceans across the world, scuba diving with the Cape Fur Seal can only be done in Southern Africa. The colonies are mostly based along the South African and Namibian coastline, and the seals can be spotted as far up the coast as Southern Angola. 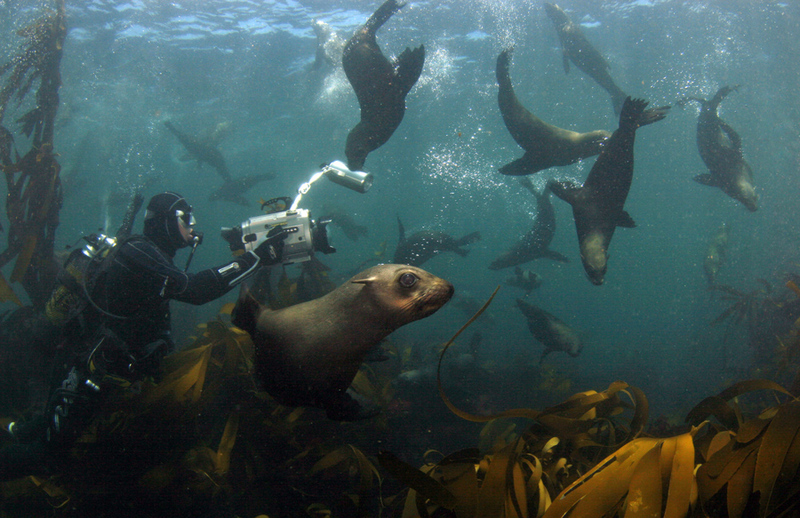 The best place for divers to swim with the seals is off the South African Western and Eastern Cape coast. 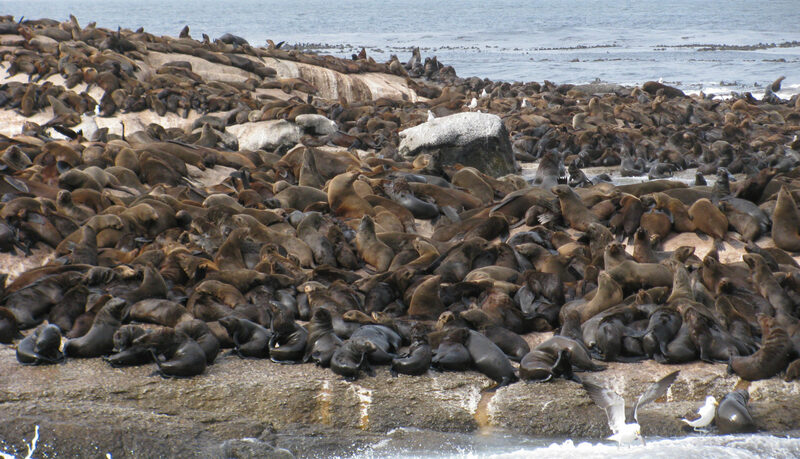 There are roughly 2 million Cape Fur Seals residing from Southern Angola to Port Elizabeth (South Africa). They live in colonies on beaches that are mostly free off humans and on islands off of the West Coast of SA. As they are far better at swimming than trying to move on land, they tend to choose homes that will keep them well away from possible dangers. Some of the dangers they face include loss of habitat and land-based predators. 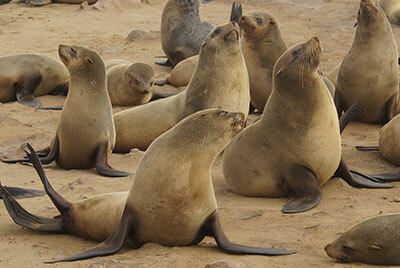 Cape Fur Seals eat mostly pilchards and anchovies. Their pups will suckle for the first few weeks of their lives before they are taught to hunt. The problem that many seals face today is a lack of food due to overfishing. Luckily, these are crafty creatures are very good at finding alternative food sources. They are highly adaptable and will munch on shrimps, crayfish and even penguins when hungry. The Cape Fur Seal has a very unique coat of fur. Their coat has two layers, a soft inner layer and a bristly outer layer. They also have a layer of blubber beneath their fur which keeps them warm when swimming in frigid water. Their fur coats have been as much of a blessing as a curse. To this day their fur is sought after by the fashion industry, even though the use of fur in fashion is now considered largely taboo. This is a rather unusual fact, and one that might be confusing as even scientists have become a little confused about why the seals like the taste of rocks. There are two possible reasons as to why they do this, the first being that the rocks aid with their digestion while the other reason has to do with the weight of the rocks providing ballast when diving. Neither theory has been supported by science just yet. When diving in the Cape with Dive the Big 5, you too might be met by a curious seal wanting to get up close. Book your scuba diving adventure today!